Bioserie Baby Toys are Made from Plants! The latest generation of eco-friendly baby toys look indistinguishable from their more toxic counterparts — and we think it’s great that you don’t have to sacrifice style or aesthetics when making more planet-friendly toy choices. Bioserie toys are the latest to pop up on our radar, and they are derived from plant sugars (which come from annually renewable plants)! Currently raising funds on indiegogo, the bioserie toy product line includes a ring stacker, a cutlery set (including an angled spoon inspired by an antique baby feeding spoon), a rattle, and a starfish teether. The 100% “bio-based” (read: no fossil fuels like oil or coal are used to create these products) are free of BPA, PVC, phthalates, styrenes, and heavy metals — and they are industrially compostable and recyclable. 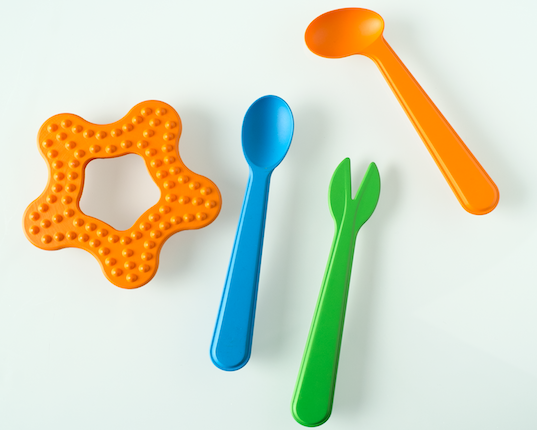 Since the colors are molded into the toys using natural colorants instead of being painted on or coated, you don’t have to worry about your little one ingesting mysterious, undesirable chemicals as she drools and gnaws on the rattles, spoons, and teethers. Get in on the ground level and preorder these colorful toys that are good for baby and the planet! Love these! Great that they're using bioplastic, and even better that the designs are so cool. The latest generation of eco-friendly baby toys�look indistinguishable from their more toxic counterparts -- and we think it�s great that you don�t have to sacrifice style or aesthetics when making more planet-friendly toy choices. Bioserie toys are the latest to pop up on our radar, and they are derived from plant sugars (which come from annually renewable plants)! 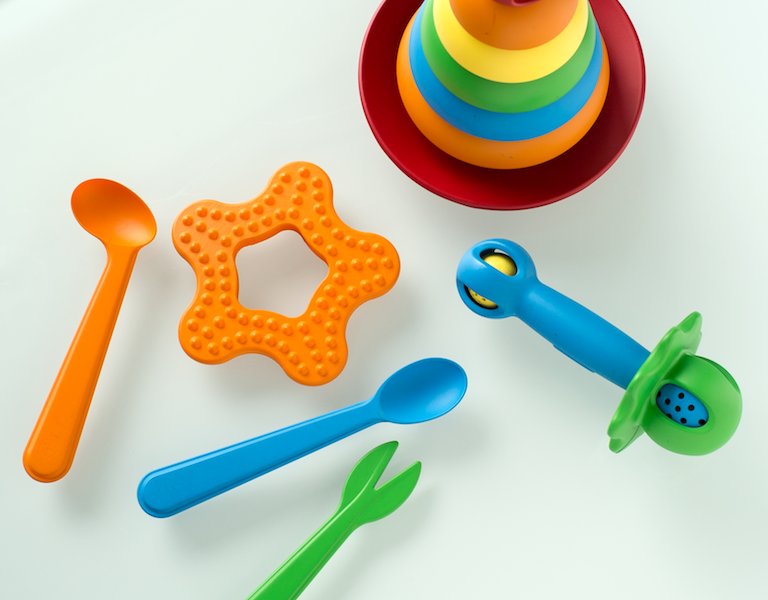 Currently raising funds on indiegogo, the bioserie toy product line includes a ring stacker, a cutlery set (including an angled spoon inspired by an antique baby feeding spoon), a rattle, and a starfish teether.